Toss together the pasta, tomatoes, peppers, sopressata, feta salt, pepper and corn. Drizzle with vinegar to taste. OMG, it is hot here in Baltimore. We have spent most of the summer hovering in the 90-100 degree area. Normally we'd get a few HOT days but we'd get some cool(ish) days in-between. However, it has been hot, hot, hot nearly every day and without the benefit of being a student (or teacher, I actually liked this policy more when I was teaching than as a kid) of getting out of school if it hits 90 before 11 AM. Now I just work at home and break a sweat as I wash the dishes. I've taken to doing tricks like the one I did with this salad and trying to cook once and eat twice. 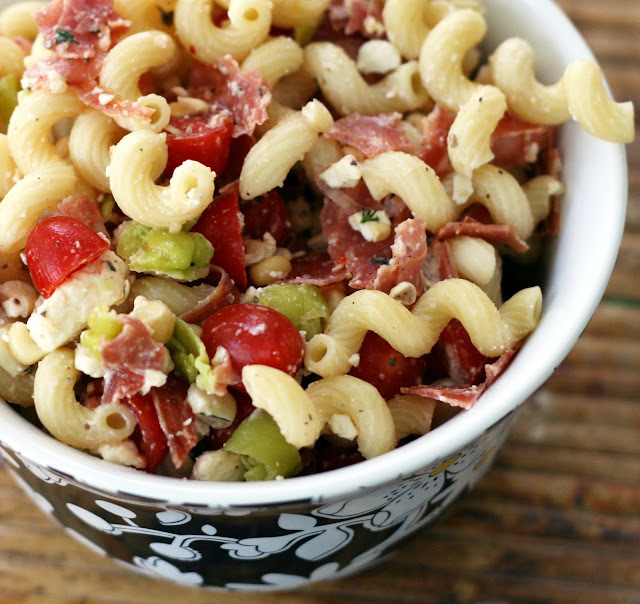 I boiled an extra amount of pasta for dinner so I could make this pasta salad without cooking at all the next day. Which, really, is more important than you'd think when living in a 1930s, non air conditioned house in the city. The summer is prime panini weather so I always have panini ingredients on hand and used them to create this Italian deli inspired salad. Easy + tasty. Win-win.